So far, no expert can with certainty explain the reason for the recent bullish market. This hasn’t stopped many from trying, with Bitcoin ETFs speculations and institutional investment being the most popular. So, can anyone come up with a better explanation as to why Bitcoin has been bullish for the past week and importantly, why it shot from $7,700 to $8,300 in less than 12 hours? Well, Clem Chambers, the ADVFN CEO, thinks he knows it and it’s all about China and the looming trade war between the Asian economic giant and the U.S.
For some time now, China and U.S have been going at it and a trade war is looming. According to reports. 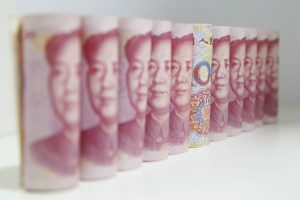 A weaker Yuan would cushion the blow for China, hence experts now believe that China is preparing for this eventuality. Additionally, the Yuan is under some major scrutiny having lost about 5% value against the dollar in the past one and half months. So, it is likely that the government is already devaluing the currency and more of it is expected. This will not be the first time the government has done it, having devalued the currency in 2015 and 2016. According to Clem Chambers, wealthy individuals who are invested in the Yuan are now running to Bitcoin as it offers the best bet to protect their money when the Yuan depreciates. These individuals have stormed the crypto market and are buying as much Bitcoin as they can. Because of the demand caused by such buyers, the prices automatically shot up, and the trend has remained the same since. In his opinion, these wealthy individuals do not even mind buying the digital asset at a more expensive price as long as they can spend the Yuan while it’s worth what it’s worth now. Chambers went on to say that if this feud goes on, Bitcoin will probably rocket as more people try to protect their money from a potential trade war. Wealthy individuals from both countries will be buying Bitcoin to protect their money and the high demand will send the price to the moon. And although this war might affect millions of people negatively, it seems for the crypto community it might just be what it needs to get more investment money. Given that none of the two countries seems to be backing down from this trade war, it seems that the bullish market is just beginning.